Quite Short Story: Mr. W.
He seemed to Jane, through her covert glance across the train aisle, like a seasoned Willoughby, posing in a sharp blue suit and tan shoes, trench slung over his shoulder. She shifted her gaze higher, only to find wolfish eyes already locked upon her, lingering like a question mark. The blush immediately swept her skin and she turned away. He was clearly no Mr. Darcy. Perhaps a Wickham? A Willoughwick? A Wickhamby? Everything about him was W, and she knew she should curb her curiosity. Though he’d given his seat to someone, she reckoned it was just for show. He looked better standing, and knew it. He moved immediately in front of her; close enough she had to cross her ankles under the seat so their legs wouldn’t touch. She sighed emphatically, and he eased out of her personal space. Still, she wondered if he could somehow hear her thoughts; wondered how many virtual locks he’d collected in his comings and goings. He glanced down at her, slyly, exposing a dimpled half-smile as he left. Decidedly Wickhamby. I really ought to put pen to paper and send some thoughtfully composed lines to friends. My handwriting, alas, has deteriorated significantly over the years. These days, I must concentrate to make my scrawl simply decipherable, let alone artistic, though mine never compared to the wondrous curves of one friend’s cursive or the modernist angles of another’s. The latter friend attended school in Switzerland when we were teenagers and I delighted in receiving her well-travelled letters, living vicariously through these chapters of her overseas escapades and eagerly awaiting the next instalment every few weeks. Her personality illuminated the lines on the delicate stationery, the tales coming to life as the blue ink cast a shadow through to the other side, now part of a cinematographic dream sequence in my memory. Letter-writing has of course long been a literary and film device, with dramatic deliveries of news from afar, invitations to effervescent balls, or kiss-offs sealed dramatically with red wax, which, once broken, forever change the plot and fate of the characters. Imagine a Jane Austen novel without letters! It was the catalyst of understanding between Lizzie and Darcy, for pity’s sake! Or that heartfelt – though dreadfully late – letter of confession from Thomas Hardy’s Tess Durbeyfield to Angel Clare, which stays ominously hidden, quite literally kept under the rug, and becomes a clear harbinger of doom. There is both a literal and figurative – and certainly tactile – difference in the nature of electronic communications that is dramatically less satisfying, even with stylized fonts. And indeed, a whole generation of young people has never experienced the exquisite pining wait for a piece of personal handwritten correspondence. Nor have they enjoyed the anticipation and elation of unfolding the stationery to reveal the physical beauty of the written word and the romance of the art that someone took the time to create just for them. The idea of waiting for anything in this world of rapid-fire discourse is perhaps what is really at issue. We’ve become addicted to the immediate gratification of the latest buzz of electronic snippets. When I’m in a cell dead zone or my battery is out of juice, I sometimes feel the adrenaline shoot through me and the fear grow in the pit of my stomach that I must be missing something important, whether relevant to my existence or not. Eventually I succumb and put the phone away, defeated. Next time this happens, I hope that I dig out pen and paper and write a letter about it. Perhaps I’ll even do so in a park under a tree. 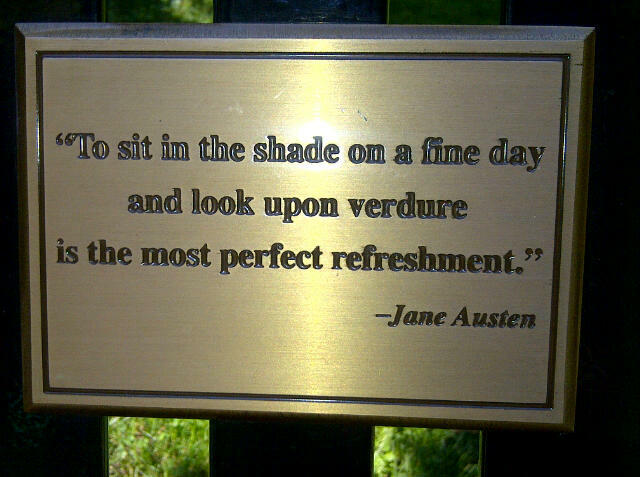 I know of a bench that has a metal plaque with the apt quote: “To sit in the shade on a fine day and look upon verdure is the most perfect refreshment.” Yes, those are indeed Jane Austen’s words. Who better to inspire a letter?